Official New Moon Cast List! 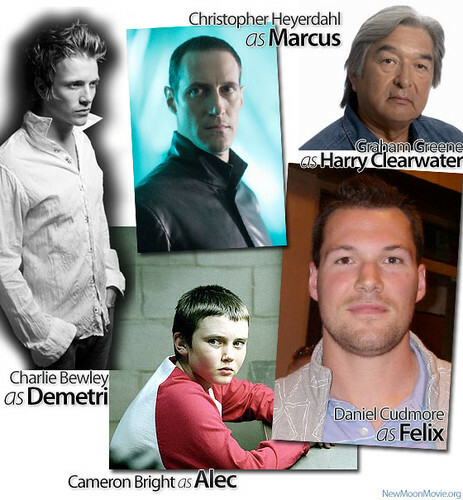 New: Daniel Cudmore as Felix, Christopher Heyerdahl as Marcus, Charlie Bewley as Demetri, Cameron Bright as Alec and Graham Greene as Harry Clearwat by editha.VAMPIRE GIRL<333. The cast list for New Moon has been finally announced! New members of the cast include Daniel Cudmore as Felix, Christopher Heyerdahl as Marcus, Charlie Bewley as Demetri, Cameron Bright as Alec, and Graham Greene as Harry Clearwater. Los Angeles, CA April 15, 2009 – Principal photography has begun on Summit Entertainment’s THE TWILIGHT SAGA: NEW MOON, it was announced today by Erik Feig, Summit’s President of Production. Kristen Stewart, Robert Pattinson and Taylor Lautner reprise their roles as Bella Swan, Edward Cullen and Jacob Black. Academy Award-nominee Chris Weitz (THE GOLDEN COMPASS, ABOUT A BOY) is the director. NEW MOON is filming on locations in Vancouver, BC and Tuscany, Italy. Also rejoining the movie are Ashley Greene as Alice, Peter Facinelli as Carlisle, Elizabeth Reaser as Esme, Kellan Lutz as Emmett, Nikki Reed as Rosalie, Jackson Rathbone as Jasper , Edi Gathegi as Laurent and Rachelle Lafevre as Victoria. New cast members include the legendary Volturi, a venerable coven of vampires who weigh and impose the laws of the vampire world, as well as two new members of the Quileute Indian Nation. The Volturi include Charlie Bewley as Demetri, Jamie Campbell Bower as Caius, Daniel Cudmore as Felix, Christopher Heyerdahl as Marcus, all Volturi enforcers. Dakota Fanning plays Jane, a high ranking and powerful Volturi member and Cameron Bright is Alec, her brother. Noot Seer plays Volturi member Heidi. Michael Sheen plays Aro, the Volturi leader. Graham Greene appears as Harry Clearwater, Quileute tribal leader and old friend of Bella’s father Charlie. Tinsel Korey is Emily, the fiancé of Sam Uley. Re: Official Cast Of New Moon! Also Dakota Fanning is playing in New Moon as Jane.